I got this book courtesy of MissAttitude from Reading in Colour – thanks a lot! Rachel Morse is the daughter of a Danish woman and African American G.I., stationed in Rammstein, Germany. With her light brown skin and blue eyes, Rachel doesn’t see herself as anything but her parents’ child. Then her parents quarrel and her mother, with Rachel and her siblings in tow, moves to Chicago in America. It was a bad decision for more than one reason – as a result a real tragedy strikes. Rachel, the only survivor, moves in again, this time with her paternal grandmother who lives in Portland Ore. Her life is not easy there- her grandma proves to be too rigid and judgmental so Rachel feels alienated, unable to fit into categories of white or black. Although told mostly from Rachel’s point of view, the novel also follows Rachel’s parents, her mother’s sympathetic boss, Laronne, and Brick – a young boy who witnessed the family tragedy and was profoundly moved by it. Rachel has to find her own path and her own place in life. It won’t be an easy journey. 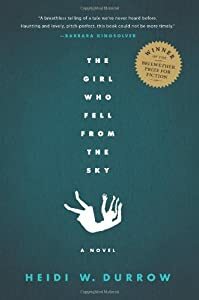 The Girl Who Fell From the Sky was an eye-opening read for me. I admit I have been woefully ignorant of the issues that bi-racial people face today in America. Apart from that it is one of those rare novels that speaks to what is deep within us all. I found it really beautifully written. Durrow draws us into the plot showing the world from the perspective of four main characters. Each narration is distinct, vibrant and complex. The story unfolds in layers, slowly and magnificently – that’s why my synopsis is so short and vague, I really didn’t want to spoil you. It is the best when you have questions answered page by page until the story of the fall, the family secrets and history is revealed to you in different haunting and precious bits. Slowly you paint a picture of what this little biracial girl has to live with on her shoulders. Mind you this is definitely more than a story of a bi-racial girl and her ability to adapt to a new place. It is also a story of resiliency and hope and awareness and insight. That’s why this book is definitely more serious and mature than any ordinary “coming-of-age” novel. In fact, talking about so many complex, adult issues, it didn’t read like a YA book at all. Rachel is one of the strongest and clear characters that I have come across recently – her characterization deep and astute. I related to Rachel although I didn’t lose my family to a terrible tragedy and I’m not biracial (whatever it might mean). However, I know what it feels like not to fit in in your own community and I know what it’s like to be ridiculed and teased because you talk “adult” and got good grades. The ending. It was supposed to be rather positive – at least the authoress wanted it to be such, she stated it in one of her interviews. I somehow wished it was more rosy, more happy, especially for Rachel and for Brick. Durrow did a terrific job creating these two of her main characters. I felt completely invested in their struggles and their victories, and truthfully felt like I could have read another 100-200 more pages about both of them. Please, Ms. Durrow, write a sequel! This entry was posted in book review, one brilliant book and tagged Heidi W. Durrow. Bookmark the permalink. I totally agree with your assessment, Blodeuedd; add to that some romance and you get a really good read. Thanks for your comment! I've been curious about this book. I might have to pick it up now. It's something I'd be really curious as to how she writes this one. AND now I'm curious about the ending too! The ending is quite unsatisfactory and a bit surprising, Melissa. Anyway I was frustrated by it. I'm glad you read this. No it's not a typical ending. But given the issue I can't think of a more realistic ending. Brooke maybe you are right but I would prefer to see Rachel growing up a bit more and making different choices (still I can't be as precise with my wishes as I would like to be because I don't want to spoil anybody).